Upon booking, a $50 per person deposit is required. Once your hotel has been confirmed to you, the deposit is non-refundable. The deposit is completely refundable if the hotel you have chosen is not available. There are a few hotels, condominiums and private villa rentals on our network that require a higher deposit. If this is the case with the options you have chosen, you will be informed by our offices. The balance of the entire golf package is due in US currency at least 30 days prior to arrival. If your vacation is booked less than 30 days prior to planned arrival, full payment is required at the time of booking. Any golf package may be cancelled up to five days prior to the planned date of arrival. A $50 processing fee per person will be imposed. For cancellations received less than five days prior to the planned arrival date, we reserve the right to impose a penalty of up to 100 percent on all money collected (as various hotels have different cancellation policies that we must honor). There are just a few exceptions to this policy. Ask your representative if the accommodation option you have chosen has a cancellation policy which is more strict, than that stated here. This stage is sent to you shortly after you reserve your package. It confirms that your hotel choice is available and that your package is being processed. 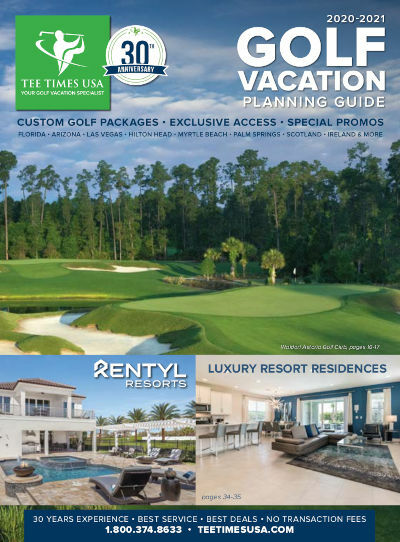 At this time, you also receive a hotel brochure, golf course score cards and directions. This stage is sent to you when your tee times are confirmed. It is an opportunity for you to review your itinerary and to make sure that everything is exactly as you expected. Replay rounds can be guaranteed at greatly reduced rates. Guaranteed replay rounds are available at select golf courses. Please ask your representative for additional information and details. Our company and cooperating agents act only in the capacity of agents for the passenger in all matters pertaining to hotel accommodations, golf course reservations and transportation, whether by motor car, or plane, etc.. and as such they shall not be liable for any injury, personal injury, damage, loss, accident, irregularity, which may be occasioned by reason of any defect in any company or personas engaged in conveying the passenger, or in carrying out arrangements of the tour. Our company is registered with the State of Florida as a Seller of Travel, Registration No., ST25149. Please note, all rates are subject to change and availability.